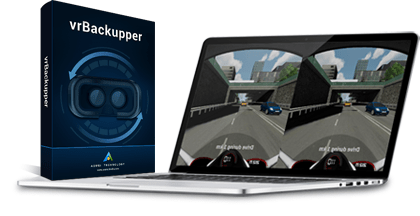 vrBackupper 1.0 Free Download Backup Restore Oculus vrBackupper is a completely free tool designed to backup and restore Oculus Rift and its games, apps, etc. It can also move Oculus Rift installation directory to other drives instead of system drive to avoid low disk space problem. vrBackupper ensures Oculus work normally after restoration or migration. What game players fear is that saved game progress lost when they restart game, or reinstall Oculus rift. In general, vrBackupper is able to backup your VR game configurations covering saved game progress, in-game level, equipment, and gold. With the improvements to computer configurations, Oculus users also want to play their games on a better equipped computer to have a better experience. However, re-download all its games on the new machine is troublesome. 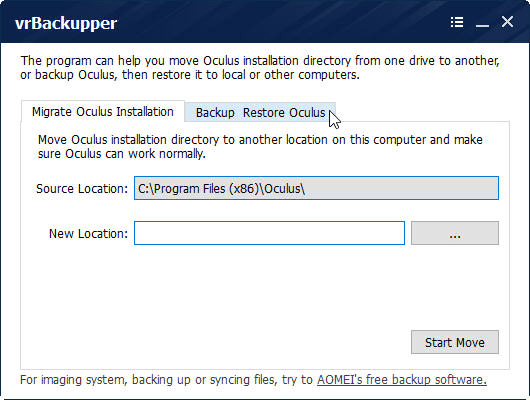 Yet, you can back up Oculus installation directory from old computer and restore them to the new one with vrBackupper all in a quick process. After restoration, you can still continue your game from the latest saving point. Oculus VR games can only be stored in the installation directory of Oculus and Oculus old versions can only be installed on system partition. Thus, new downloaded games usually encounter a problem that there may be not enough space for installation. In this case, move Oculus installation directory and all its games to another non-C: drive with vrBackupper is an intelligent choice. There is also another way if there are other drives which have enough space on the system disk. You can use partition software to extend partition to solve C: drive running out of space, instead of moving Oculus to another drive. Move Oculus installation directory to another drive to solve lack of disk space problem of installing games. vrBackupper ensures Oculus work normally after moving to new drive. It can also transfer Oculus installation directory to external drives, but you have to insert the external drive into computer first and keep its drive letter unchanged every time you use Oculus. Quickly make a backup of Oculus Rift platform as well as its inclusions, virtual reality games, virtual reality apps, installation directory, etc. to a safe place without data loss. Later, you can restore Oculus to your computer or other computers easily. Of course, you can selectively backup only VR games and apps. In this way, when it comes to recovery, you have to first install Oculus Rift and then restore these data. When original Oculus Rift gets damaged, use vrBackupper to recover all data as well as personalized settings back; or, if you need to install Oculus and all its VR games/apps on another computer, you can just restore them to the destination machine with vrBackupper as long as you’ve ever made a backup of Oculus package. As long as your new system supports Oculus Rift, you can normally play VR game after restoration. To download vrBackupper 1.0 you need to click on the download now button.